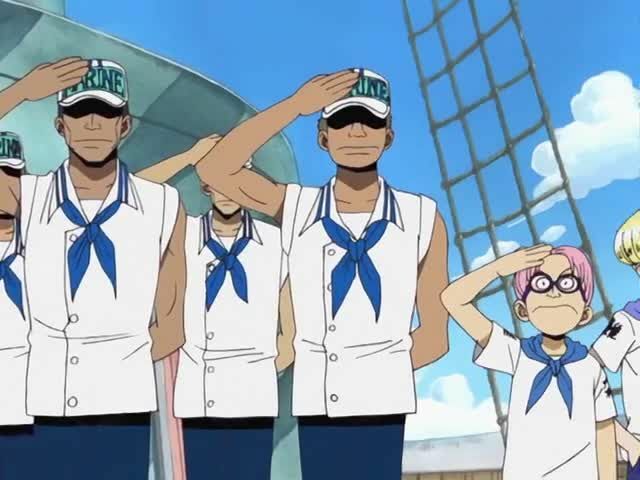 Stream anime episodes online for free, Watch One piece Episode 68 English version online and free episodes. Anime Episode guide One piece Episode 68 English dubbed Try Hard, Coby! Coby and Helmeppo’s Struggles in the Marines! Coby and Helmeppo have enlisted into the navy as oddjobbers. Coby works hard towards his goal of becoming an officer. They get into an argument about whether it is possible, which escalates into a struggle, during which they accidentally fire a cannon, destroying a whole building. Later they are taken along on a trip to turn over Helmeppo’s father, the former navy captain, “Axe-Hand” Morgan, to Vice-Admiral Garp to stand trial for his crimes. While receiving the prisoner, Garp falls asleep. Morgan slashes the admiral’s chest, takes Helmeppo hostage, and, stealing a boat, makes a run for his life.